I thought it would be fun to take a look at some of the guys that don't seem to get a lot of publicity around the Big Sky (or maybe it's just that I don't talk about them enough). Sometimes role players who don't get their due, or starters who are overlooked because of other guys on the team. Anyway, a quick look at six guys who match that description for me. - Jordan Richardson (Weber State) - After the departure of Damian Lillard to the NBA, much of the Weber State PG talk was about Gelaun Wheelwright, the talented sophomore. But quietly, Richardson has been excellent. He is making 49% of his threes, and leads the conference in assist to turnover ratio. Not bad. - Jayson Cheesman (Southern Utah) - He has been a bad offensive player, shooting just 39% despite taking most of his shots near the rim. But he has excelled defensively and rebounding the basketball. He is fourth in the conference in defensive rebounding percentage, and first in block percentage (as well as top 25 in the country in that stat). He has had a nice debut season for Nick Robinson. 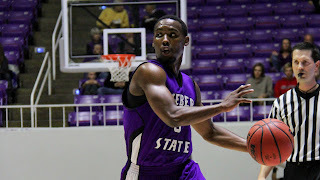 - Jordan Gregory (Montana) - He started at the beginning of the year, and now is a valuable bench player for the Grizzlies. He is showing signs of being a really good offensive player, knocking down outside shots and showing good strength with his ability to drive the basketball. He has work to go as a distributor, but he should slide into the starting spot next year and be a really good player. - Lateef McMullan (Portland State) - Last season he was a bit of a chucker offensively, making just 31% from down. His TO rate was higher than his assist rate, and he was just an overall inefficient player. This year, he has been huge for the Vikings and showed vast improvement. He is up to 40% on threes, much better inside the arc, and his assist/turnover ratio is a lot better. If he keeps it up, it's not a stretch that he could get all-conference mentions. - Max Jacobsen (Northern Arizona) - NAU is thin upfront, but Jacobsen has been a very pleasant surprise. He is scoring well in the post, and making over 60% of his shots. He is not a great rebounder, but has been respectable, especially on the offensive glass. One shudders to think of the NAU offensive post game without him this year. - Tomas Sanchez (Idaho State) - Sanchez has become ISU's best player, with a ton of versatility and ability to help the team in a multitude of ways. He is the team's best outside shooter, leads the team in assists and steals, and is second on the team in rebounding. He hit the game-winner last week against Sacramento State. He is a ton of fun to watch. Anyone else you think deserves more due?